Good price. Good location. Helpful staff. Short drive to SUNY Cortland. Nice room. Nice amenities. Where to find Dryden hotels near an airport? 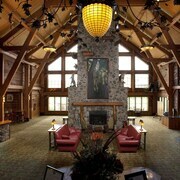 Where can I find hotels in Dryden that are near tourist attractions? You'll find only 1 accommodation option that are less than 0.1 kilometres (0.06 miles) from Dryden's downtown, so it's wise securing a place to stay as far in advance as you can. The The Statler Hotel at Cornell University, New York, which is the nearest accommodation, sits 18 kilometres (11 miles) from downtown Dryden. Another alternative is the Hope Lake Lodge & Indoor Waterpark, situated in New York, which is 11 kilometres (7 miles) from downtown Dryden. 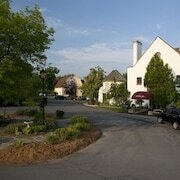 You could also check out the La Tourelle and the Hilton Garden Inn Ithaca. The La Tourelle is positioned 20 kilometres (13 miles) away from the middle of Dryden. 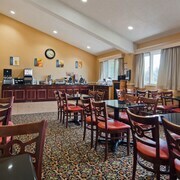 The Hilton Garden Inn Ithaca, is positioned 19 kilometres (12 miles) away. 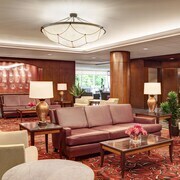 Other hotel options worth checking out around Dryden are the Courtyard by Marriott Ithaca Airport/University and the Homewood Suites by Hilton Ithaca. The larger Finger Lakes Region area is worth seeing also. Finger Lakes Region boasts lakes, and commonly visited Finger Lakes Region destinations include craft workshops and open-air markets. Adventurous travelers can also try cross-country skiing here. The closest places to spend the night in Ithaca are Cortland and Cortland. Cortland is 16 kilometres (10 miles) to the northeast of Dryden, while Cortland is 14 kilometres (9 miles) to the northeast. Cortland hotels and apartments include the Holiday Inn Express Cortland and Hampton Inn Cortland. 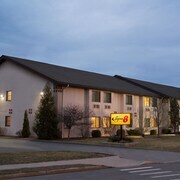 The Comfort Inn Cortland and Country Inn & Suites By Carlson, Cortland are some of the accommodation options in Cortland. Before you say goodbye to Ithaca, make sure you catch local game. Visit Carrier Dome to the north of Dryden. Those sports fans wishing to find a bed close by can make a choice from the Sheraton Syracuse University Hotel & Conference Center or the Residence Inn Syracuse Downtown At Armory Square. For travelers planning on arriving through Tompkins Regional Airport, you may choose to book a room at Ramada Ithaca Hotel and Conference Center, or Trip Hotel Ithaca, which are both a short ride away. 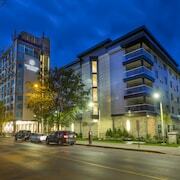 What are the most popular Dryden hotels? Are there hotels in other cities near Dryden? What other types of accommodations are available in Dryden? Explore Dryden with Expedia.ca’s Travel Guides to find the best flights, cars, holiday packages and more!